I have a vision of a world where parents and children connect easily, families feel relaxed and happy together and children are emotionally secure. But I know from talking to many parents that reality can turn out very different from this. Even if we’re committed to gentle parenting and want to create a secure, connected family, we parents often find that life isn’t relaxed and happy at all. Today I want to shed a gentle light on one important reason why this is happening. I’ll be highlighting something that many of us do in our families that not only contributes to these exhausting power struggles – but is also unintentionally traumatising for our children. I’m talking about what we often refer to as “telling off” – the way we’re disapproving, stern or shouty, and use threats, consequences or punishments in an attempt to make our children listen, change their behaviour or do things we need them to do. There are good reasons why we do this. 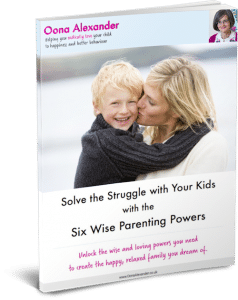 Typically our children are being rude, they’re not listening to us, they’re refusing to do as we say or they’re acting dangerously – and we feel we have to tell them off to get them to listen to us. Good reasons too why we’re often more reactive than we’d like to be: we’re often exhausted through lack of sleep and the endless duties of life as a parent. We also tell our children off because it’s what was done to us as children. It’s what comes out of our mouths when being nice hasn’t worked – even if we don’t like doing it. And, there’s another powerful reason why we do this: Underneath it all, we’re often scared of what might happen if we don’t tell our children off. When we see “bad behaviour”, we feel it is our role to act as a powerful deterrent – hoping that this will help our children become socially acceptable individuals. The problem with this approach is that when we’re disapproving or shouty with children, they experience this as a withdrawal of love. You and I know we don’t actually stop loving our children when we tell them off. In fact, it’s often because we love them so much that we launch into them. But what we often overlook is that children don’t know this! When we’re stern or explosive, they feel we’ve stopped loving them. You cannot imagine how deeply wounded a child feels when we’re a bit harsh. So this means that when we tell them off, we actually shake their world. And when this experience is repeated, they no longer feel secure in our love. They come to believe that we only love them when they behave in certain ways. This is traumatising for children – and has a very negative effect on their behaviour. It’s of course the opposite of what we intend as parents. The very last thing we want to do is to traumatise our children in any way at all. We simply don’t realise the effect we’re having on our children. And even if we do have concerns of this kind, we don’t know what else to do about their behaviour. Well, the good news is that telling off isn’t a necessary evil of family life. We can literally replace telling off with loving guidance that is kind and connecting – and so change this dynamic completely. This may sound counter-intuitive because we’re talking about unwanted behaviour here, aren’t we? But, believe me, when we’re kind and show children that we believe they’re fundamentally reasonable humans like us, they become much happier, calmer and more reasonable – and all in a short space of time. In my experience a really good starting point is to open our hearts and have faith in our children’s better nature. I’m going to share with you three powerful steps that will help you get started with this. Using these steps you’ll be able to help your children to feel loved, even when you’re addressing difficult behaviour. 1) Empathise with your child over the reasons for their behaviour, showing real understanding for what may have prompted it. This is really important. 3) Problem-solve with them to find ways to resolve the situation – happy solutions that feel good for them and good for you too. When we use empathy, problem-solving and non-judgey language, our children not only feel loved and understood – they also get the opportunity to make a contribution to solving the situation. It’s a powerful mixture which makes “telling off” redundant. I believe this is not only important for our children but also a great relief for us parents as well. And the beauty of it is that parents who use this approach report almost instant positive changes in behaviour! And it takes us one step closer to a more peaceful world where parents and children connect easily, families feel relaxed and happy together and children are emotionally secure.